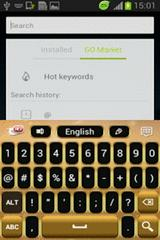 Neon Gold GO Keyboard - Here is the coolest keyboard you could download: Neon Gold GO Keyboard! Important elements: * APPLY THE THEME: After the download is done, tap OPEN and then tap on 'Set Active Theme' from the menu. Select our theme from the next list! * The design of this theme was done by a professional designer, as you can probably see by taking a look at the screenshots! 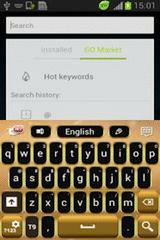 * This is a keyboard theme for the GO Keyboard application, so make sure you have GO Keboard installed! We have an exciting new theme we can not wait to share with you: FREE DIFFERENT KEYBOARD! DOWNLOAD Free Different Keyboard NOW and get ready to be amazed by your new keyboard with innovative graphic details put together by our amazing designer team! We know you love to escape reality, that is why we are very excited to present our latest release: SKY NEON KEYBOARD! DOWNLOAD Sky Neon Keyboard NOW and make your smartphone take you on a fantasy ride every time you want to chat with your friends! Our designer team is ready to launch a new theme, created just for you: NEON KEYBOARD! DOWNLOAD Neon Keyboard NOW and upgrade your smartphone display with the brightest shades of neon green! Our very talented designer team is ready to launch a brand new keyboard theme, created especially for you: HEART KEYBOARD! So DOWNLOAD Heart Keyboard NOW and make your display stand out with the incredible hot red graphics and futuristic design! If you were looking for a theme that will give your display an unique touch, we have just the theme for you: KEYBOARD NIGHT THEME! DOWNLOAD Keyboard Night Theme NOW and enjoy your keyboard with these amazing graphics! We all know everybody loves pink, so how about some pink stars? Check out our new theme released, PINK STARS KEYBOARD! DOWNLOAD Pink Stars Keyboard NOW and we'll send you in a pink universe! We all know how much you love our wild prints, so check out our new theme release, especially designed by our very creative designers: KEYBOARD CHEETAH FREE NEON! DOWNLOAD Keyboard Cheetah Free Neon NOW and let these amazing animal print graphics and neon colors impress you!